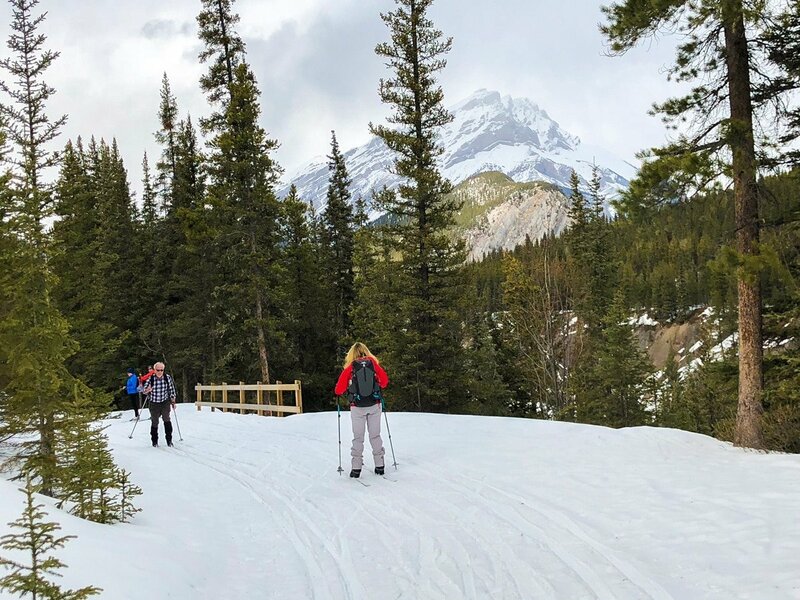 Cross-country skiing from the Goat Creek parking lot above Canmore to the Banff Springs Hotel is a classic XC ski in the Canadian Rockies. 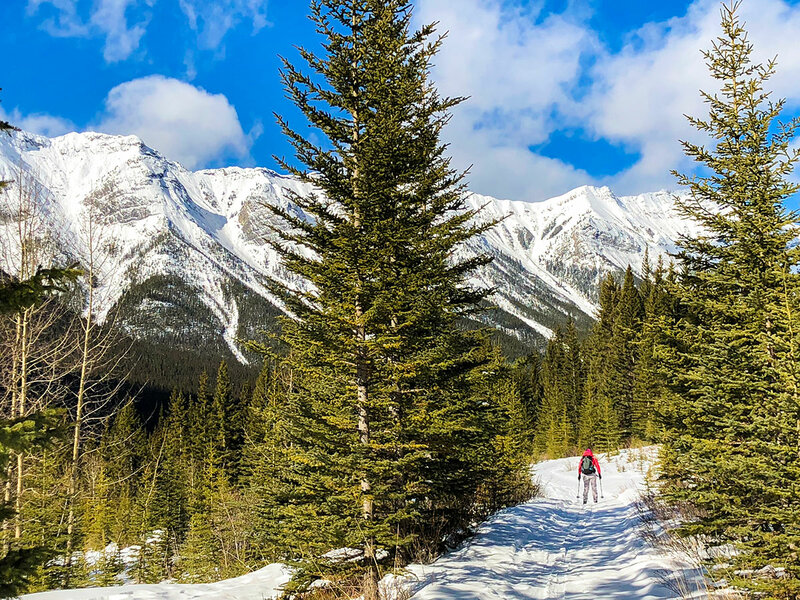 This ski trail takes in some epic scenery. 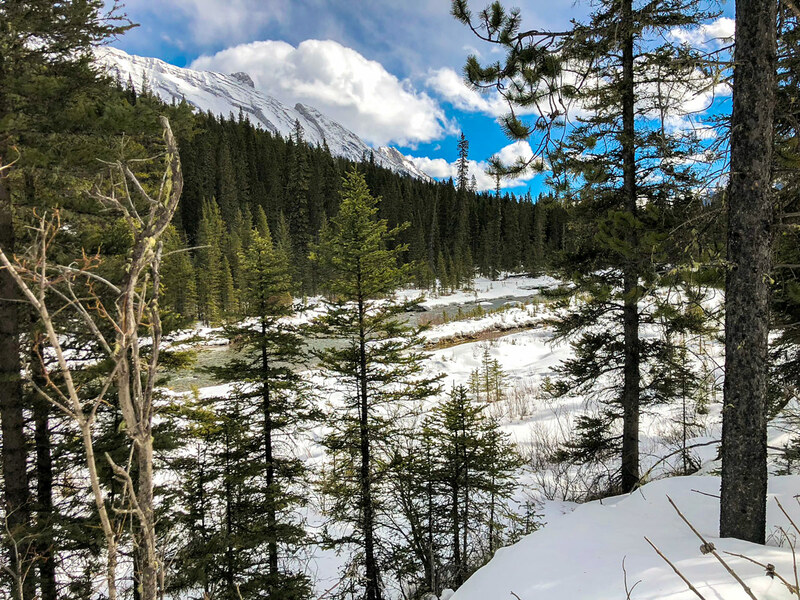 The first half of the route is infrequently track-set, while the trail improves markedly once you enter Banff National park. 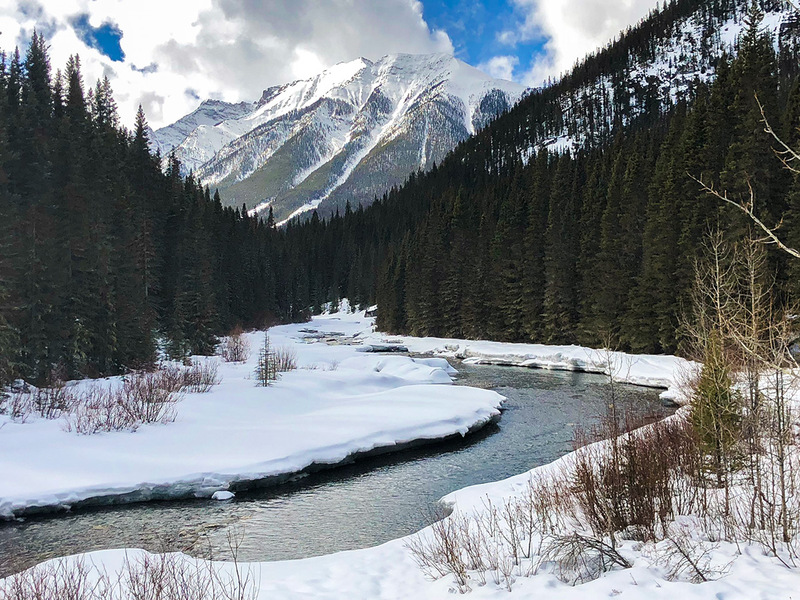 We usually park at either the Fairmont Banff Springs parking lot after the round-about, or the Bow Falls parking lot and take a taxi to the Goat Creek Parking lot. The taxi is usually $75-$125. 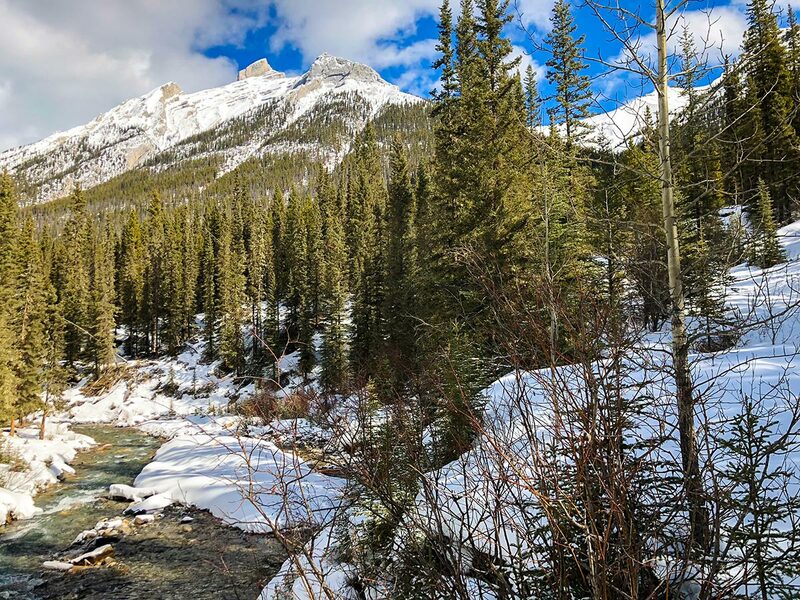 The Goat Creek Parking lot is 5.2km past the Canmore Nordic Centre turnoff on the Smith-Dorrien (Hwy 742). 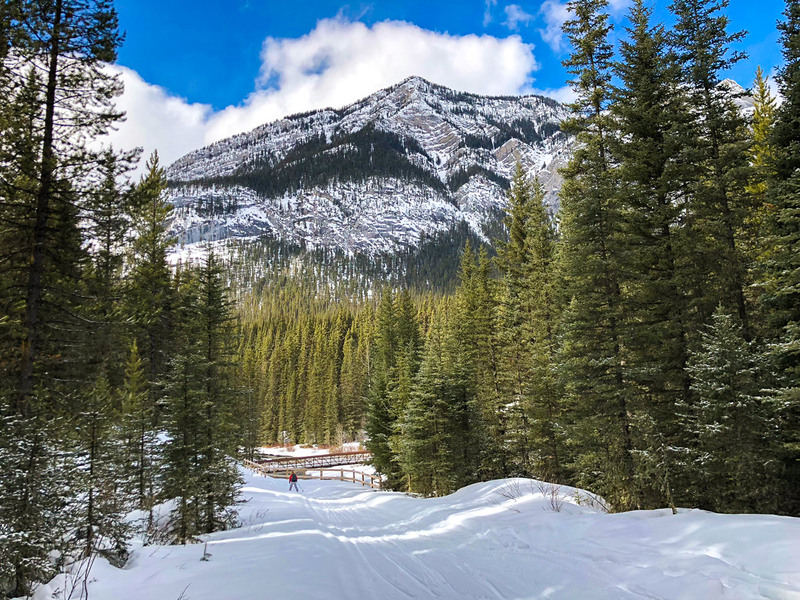 When people say they skied from Canmore to Banff, they are usually referring to this cross-country ski, which actually starts at the Goat Creek Parking lot on the Smith-Dorrien. 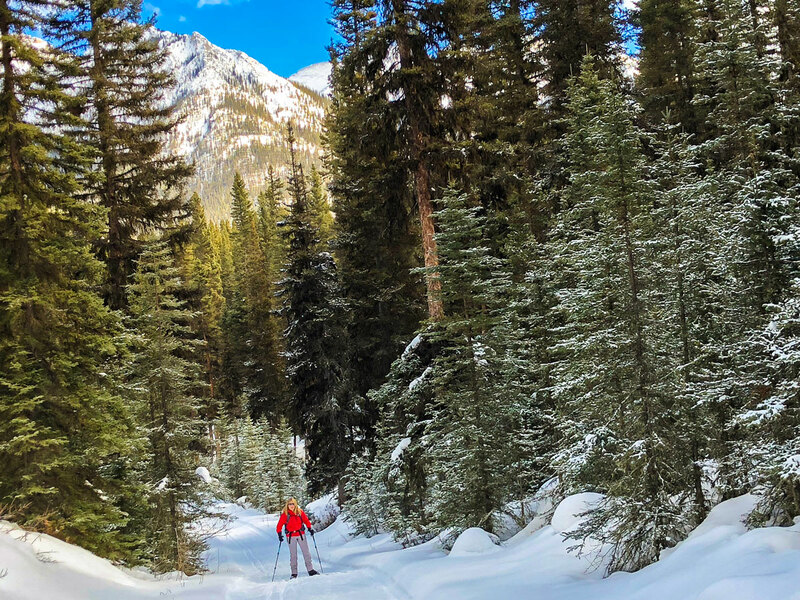 The hardest part of this XC ski route is figuring out how to plan your shuttle, as it’s a long trip if you go there and back (though there are many cross-country skiers that do the return trip). 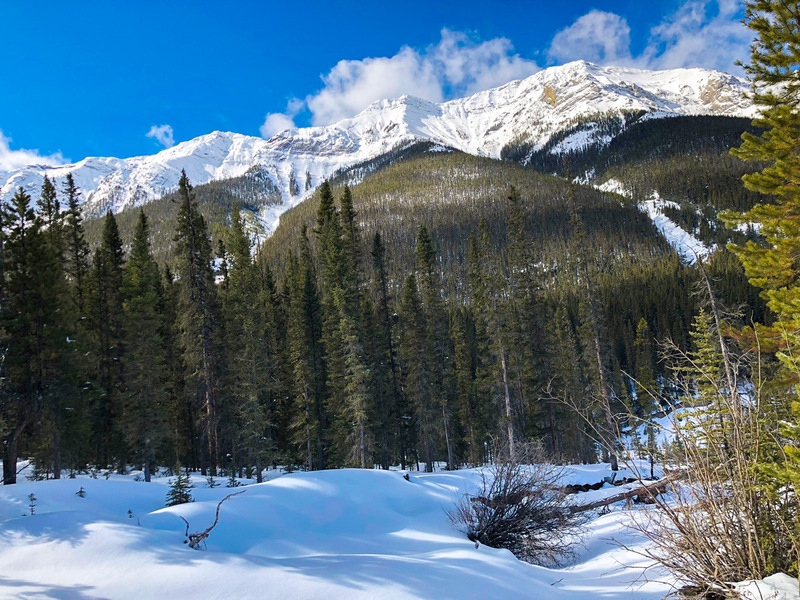 We normally leave our cars at the Spray River Trail parking lot (near the Banff Springs Hotel) and get a Taxi to pick us up and take us to the Goat Creek Parking Lot, which is on the Smith-Dorrien above the town of Canmore. The drive takes about 25-30 minutes and taxi fares are usually $75-$125 depending on how many people there are. 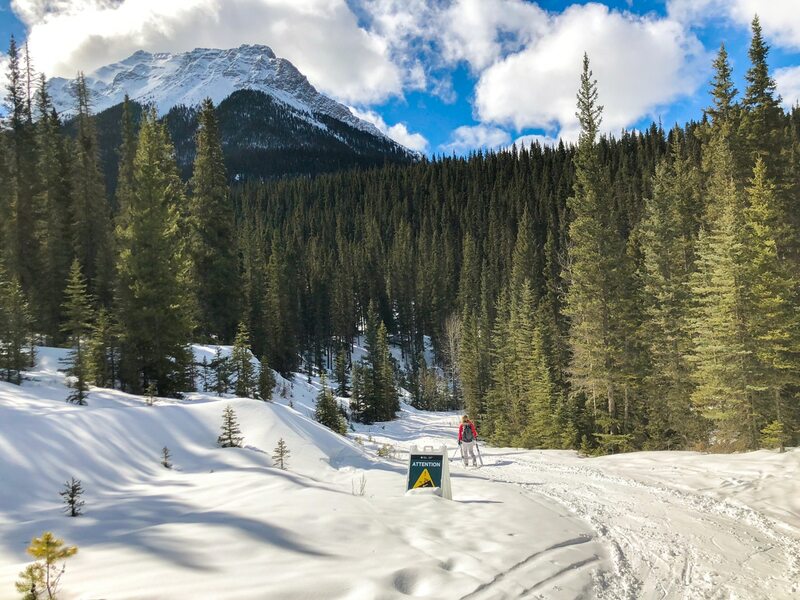 We prefer to ski from Goat Creek to Banff as the route has 425m of descent and only 175m of ascent, making it a more pleasant day out. From the Goat Creek parking lot, the route enters the trees on a clear path. The first 500m of the path is often in terrible condition, with footprints as day trippers explore this path before returning to their cars. If the route has been recently track-set this will be a great day skiing. 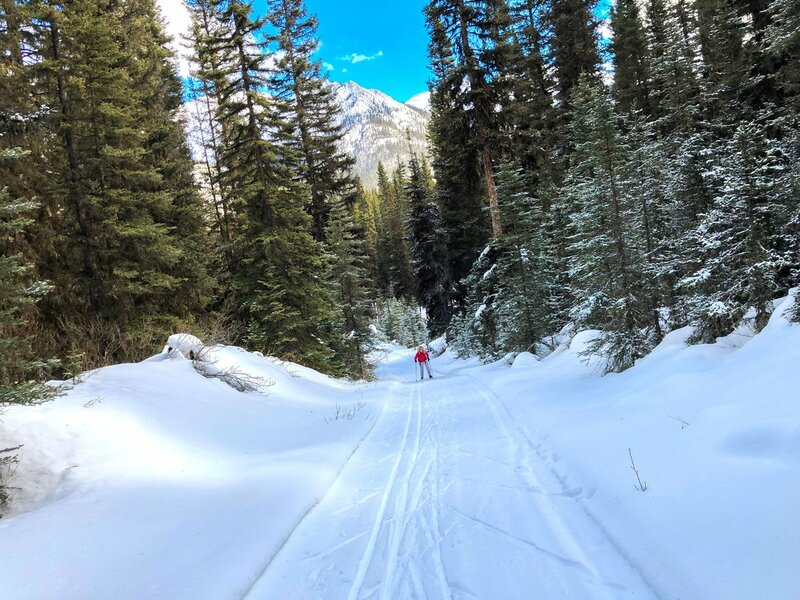 Unfortunately, the trail is not track-set as often as many other XC ski trails in the area. 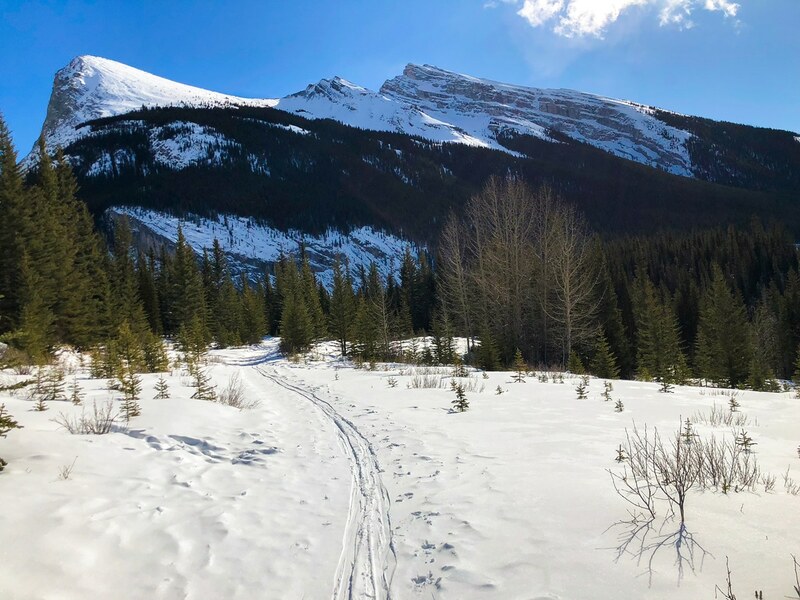 It also sees a lot of use from snowshoers, hikers and backcountry skiers, who unfortunately often obliterate the XC Ski tracks that have been set. This means it can be a pretty rough trail if it hasn’t been track-set recently. 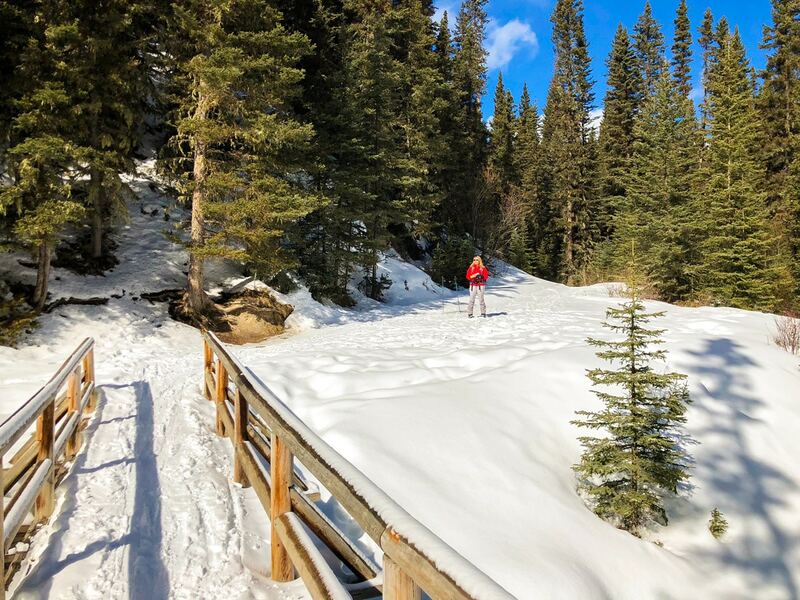 The trail goes up and down, and is very clear as you ski north along the Goat Creek trail. The early part of the route has fairly easy descents, and can be fun in good conditions. 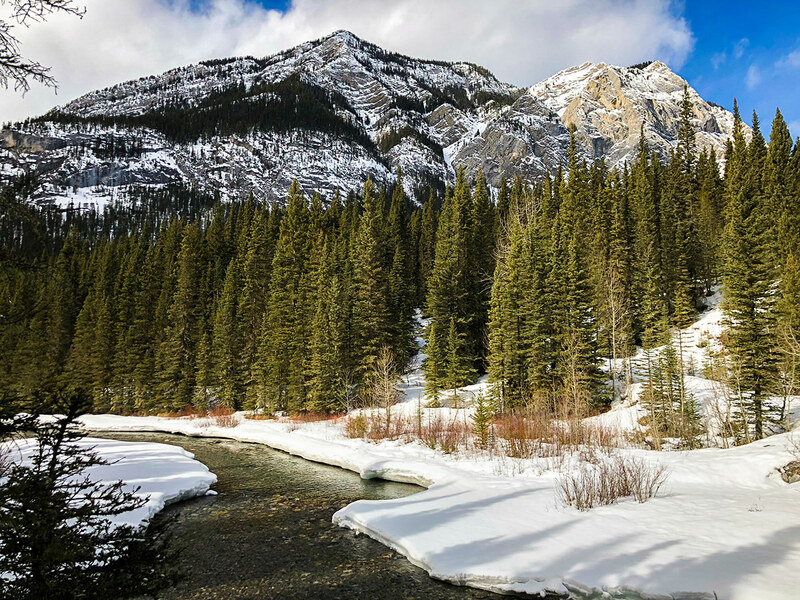 You get very nice views to your right up at the various sub-peaks of Mount Rundle. 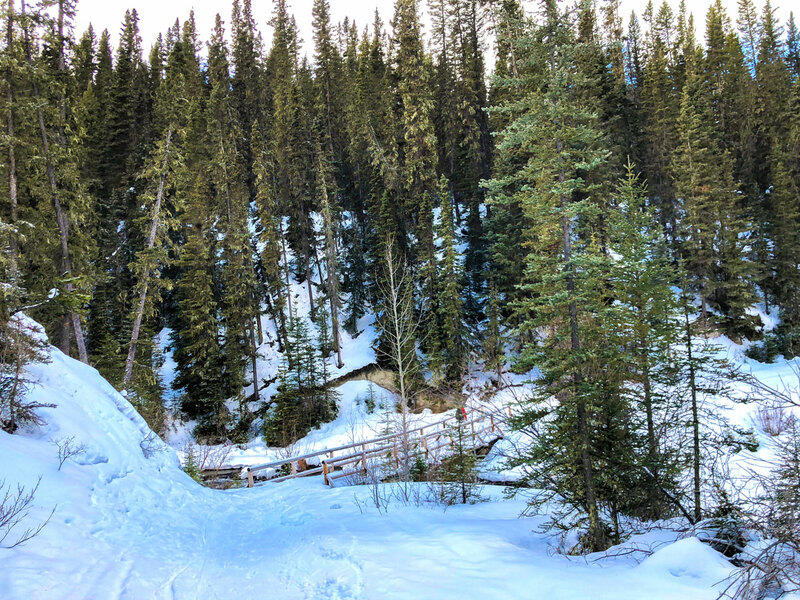 After about 6.5km of XC Skiing you will get to a big hill that descends to Goat Creek Bridge. This hill is the crux of the XC ski trip, and can be very, very challenging, especially if the snow is hard-packed. The track goes down and around a bend, and then immediately comes to a bridge over Goat Creek. If it’s hard-packed it’s both very fast and very hard to get any stopping power on your skis. 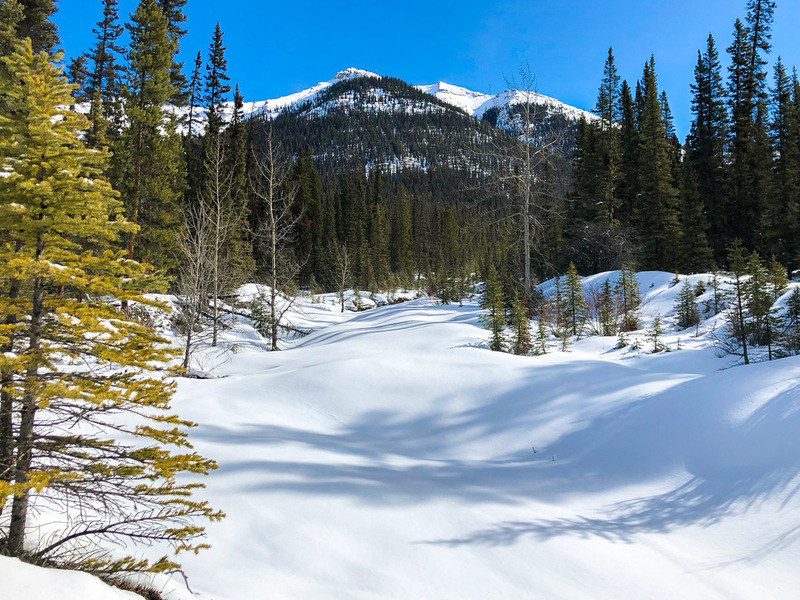 There have been accidents here, and it is recommended that you remove your skis and walk down this path the first time you do this trip. After the bridge you ski around to your left, eventually crossing another bridge at roughly 9.0km over the Spray River. 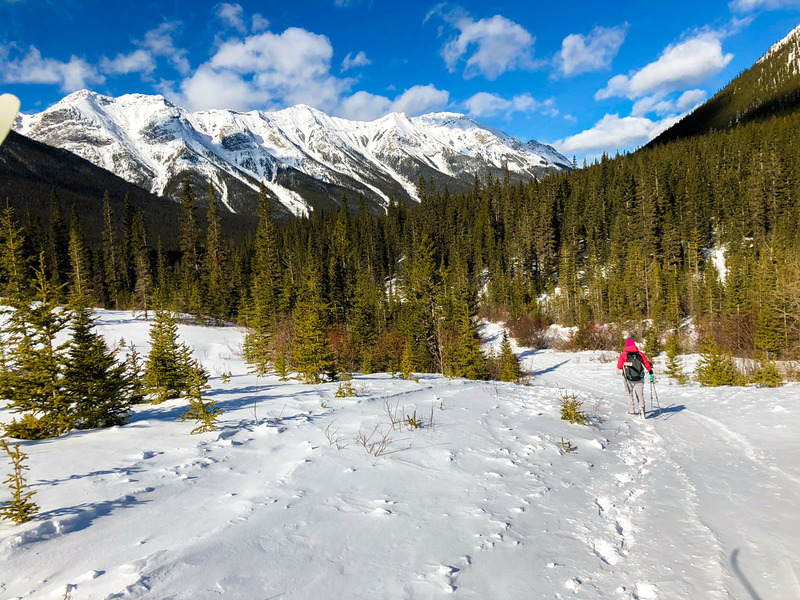 Once over the bridge the trail usually improves, as Parks Canada track sets their portion of the route more often than Alberta Parks. 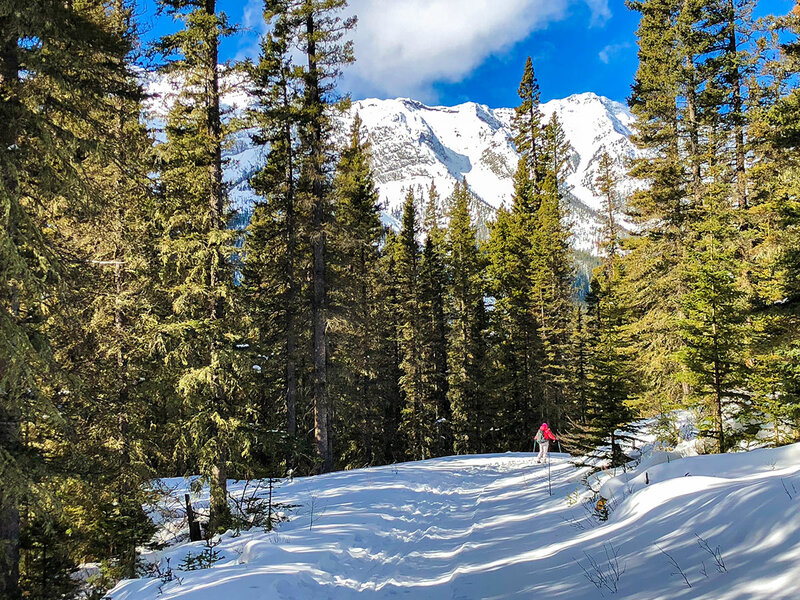 Follow the ski trail as you head up a hump before continuing the path on the western side of the Spray valley. At roughly 13.5km from the start come to a picnic area, with a partially covered shelter. From here the trail splits, make sure to stay on the left-hand path signed for XC Skiers. 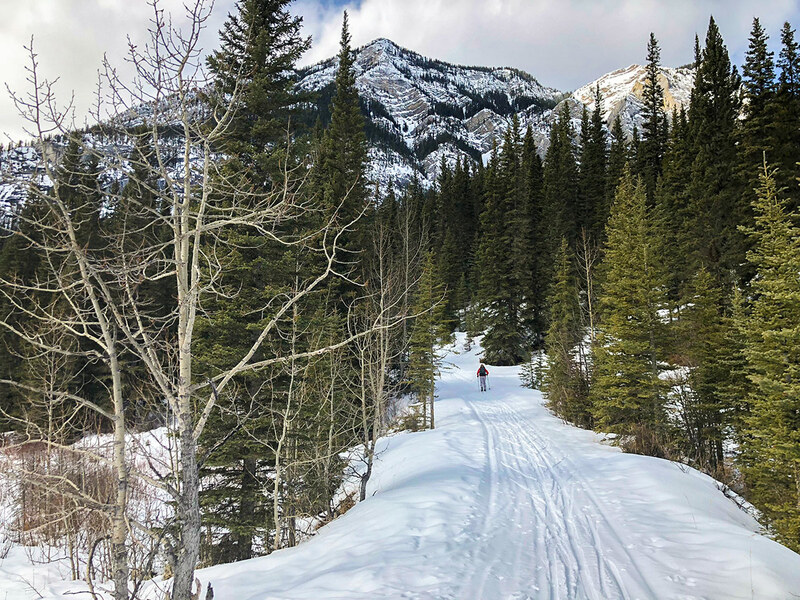 There is a separate path for snowshoers and fat bike users. 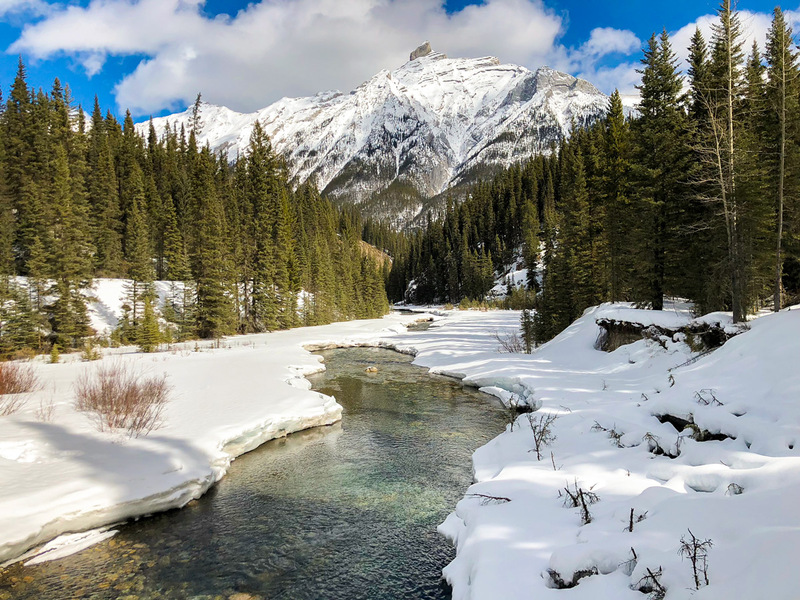 Follow this route and in 5.5km you end up the Spray River parking lot, where you left you car, just down from the Banff Springs Hotel. 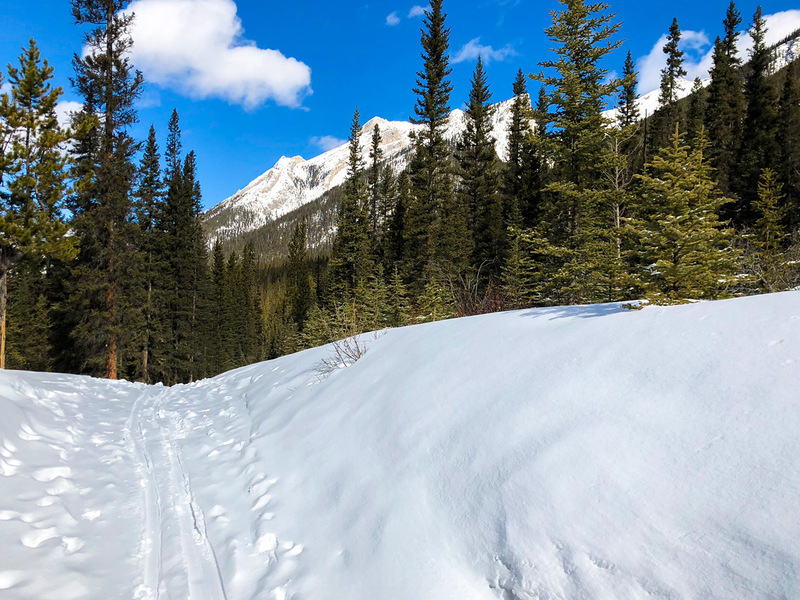 Check out recent grooming for this trail before heading out. 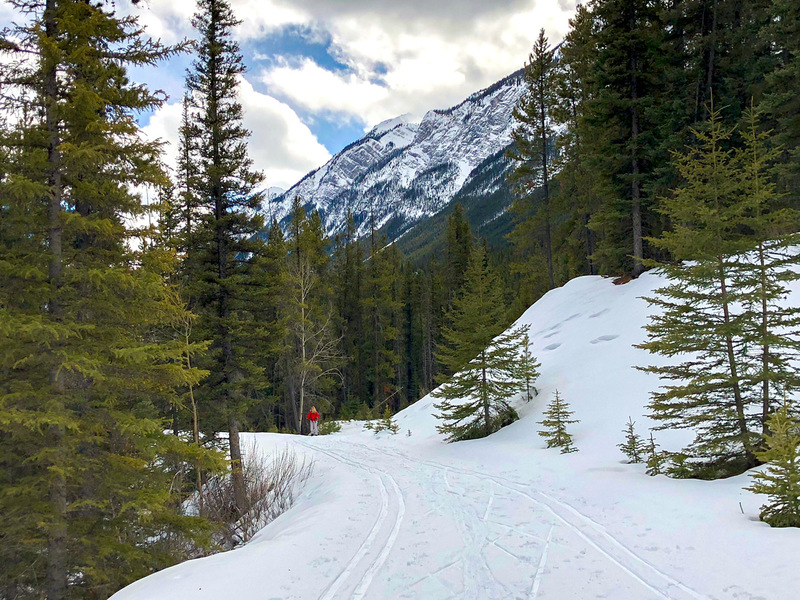 Other trail users can destroy the track-setting and make this a more challenging ski compared to when it has been recently track-set. 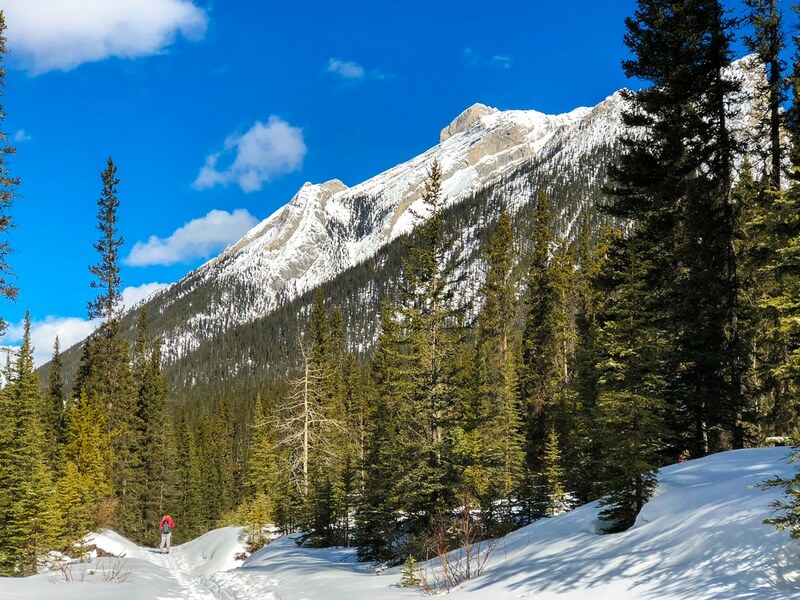 Rent Skis at Snowtips-Bactrax on Bear Street or Trail Sports at the Canmore Nordic Centre. Enjoy Coffee and French-inspired pastries at STOCK Food and Drink in the Fairmont lobby before or after your ski. 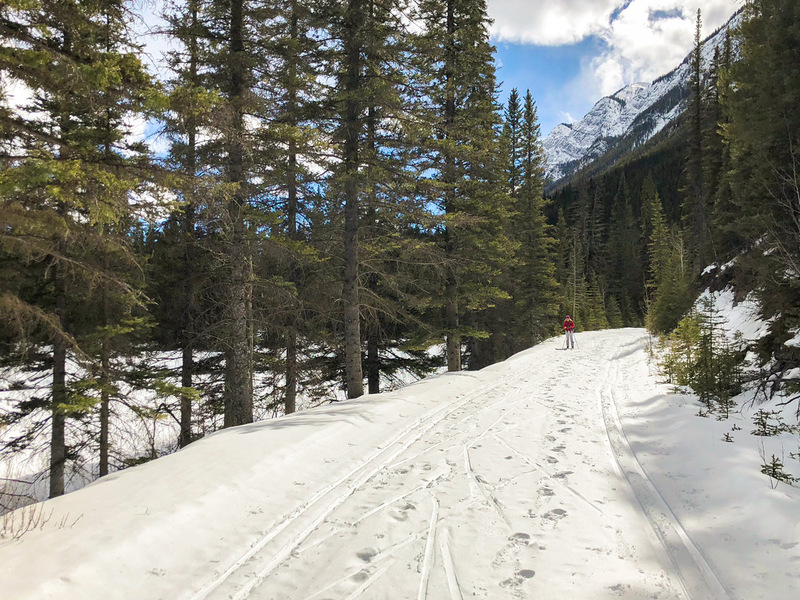 While we use cross-country skis, this trail is often done with Light Touring skis and there are often snowshoers on the trail as well. 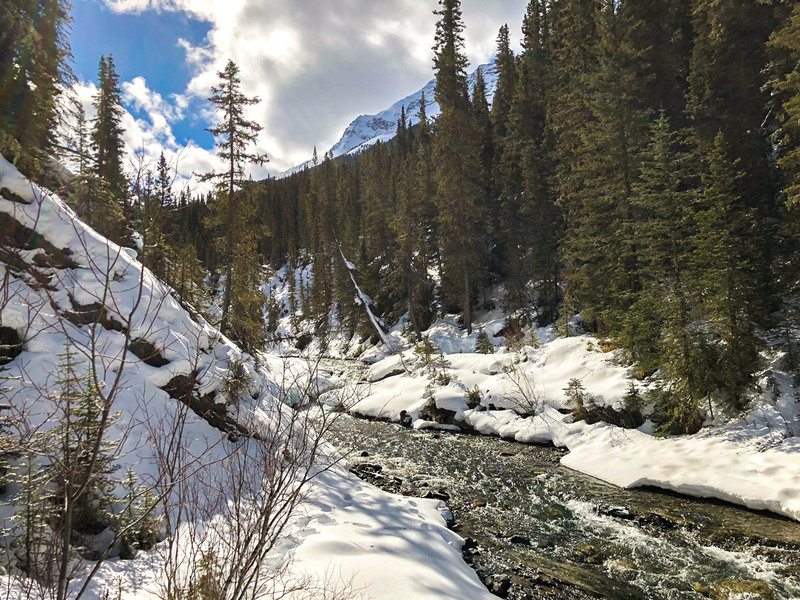 Treat yourselves to a Swiss fondue at the historic Waldhaus Restaurant on the Fairmont Grounds, just up from Bow Falls. For something more casual grab a beer and a pretzel at the Waldhaus Pub.